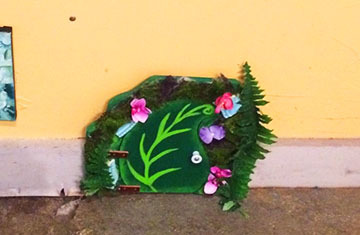 Putnam, Ct is home to a series of Fairy Doors! Heather, the owner of Epiphany on Main, and an artist herself, told me about them, thinking I would enjoy making one. And she was right! Although I do have to say it was a lot of work, and ended up being a family project. Most people just do one, but as always I have to push the envelope, and do TWO! Then I came up with the idea that they should open. I know I am crazy! The took me a while, as I ran into a few issues. I miscalculated the hinges, so doors were difficult to open. Then I was not happy with the shape, so my son and his friend helped me cut it on the ban saw. I also had to create the images inside, so I used an old pic I had taken of my daughter dressed as a fairy, and photoshopped it into a photo I had from a wedding at St Clements castle in Portland. 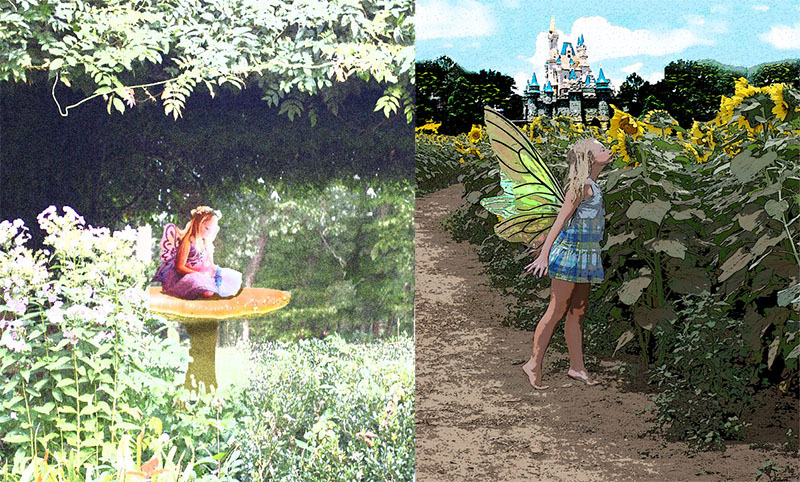 The other one was created from a photo I took of her at Buttonwoods and then I photoshopped a certain castle into the image. I added a few filters on the image and Viola! I had a fairy picture. This ended up being quite a project, one that included the whole family. Have I told you how lucky I am to have a helpful family? Either way, they are finally, and thankfully done!!! The doors also need to be weather resistant, and when I saw that one may not be, I decided to install it at my wall at the hall at Silver Circle Gallery. The other one will be installed with a bunch of other ones throughout the Putnam area, for people to find. This is my first year doing this, and I believe they have a website to let you know where to look. When I get this info, I will be sure to pass it along to you! In the meantime, one is installed at my wall, for you to visit. And don't forget to look inside! Images inside my fairy doors, my daughter at different ages and places. Second door inspired by the movie "Fantasia"